For those of you wondering what is going on at the Historic McSwain Home - here is an update of work and plans. As of December 2018 - long awaited construction is nearly complete at the Society's 1915 historic McSwain Home on Old US 41. 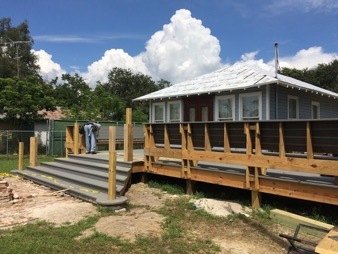 A new front deck and ADA ramp has been built to allow the opening of the building. AND it is with sincere gratitude that we acknowledge Tri-Town Construction's generous contribution of labor for installation of a new metal roof and to ABC Supply which is donating the roofing material! A new roof was greatly needed as near this time last year, Hurricane Irma removed many of the buildings aging shingles. Also to be noted with great gratitude is the vision of our City Council to fund a Historic Preservation Grant Program for their Historic Preservation Board. The Society was successful in a grant application which will reimburse for much of the current construction. Special thanks go to city manager Arleen Hunter, Community Development's Mike Fiigon, and to the members of the COBS Historic Preservation Board and its chairperson Dallas Revord for approving the substantial grant. It is due to the commitment, efforts, and kindness of all of these people that we are very close to accomplishing our goal of having the McSwain Home open to the public in historic downtown Bonita Springs. Click here for video about the history of the McSwain Home. After the completion of the infrastructure and roadwork in downtown Old US41 in front of the house, we started a Front Landscape Project that it is part of a project to fulfill grant requirements from the City of Bonita Springs Facade Grant, a grant from the Gannett Foundation, and the Young Professionals at Bonita Area Realtors. 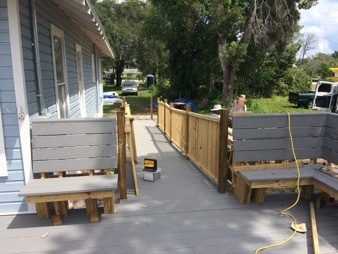 To get to this point, Strader acknowledged, that the Society has received a lot of help, including a façade grant from the City of Bonita Springs as well as a grant from the Fort Myers-News Press/Gannett Foundation. 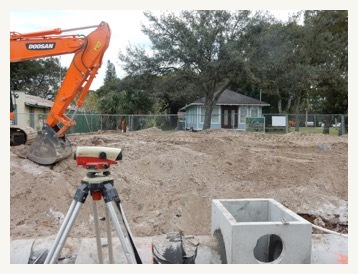 The Society received another incredible gift when Wright Construction Group (WCG), the contractor in charge of the downtown infrastructure work for the City of Bonita Springs generously agreed to supervise the BSHS front design project. 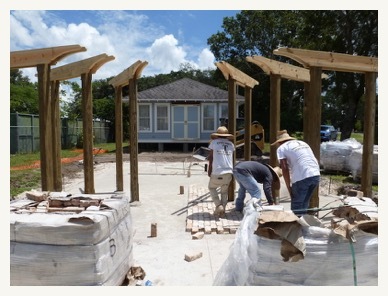 WCG is a Fort Myers based company with a long history of community involvement. The company is also donating expertise, grading, concrete work, and along with Timo Brothers are contributing materials and labor for the paver work. The pavers being used are reclaimed clay bricks from turn-of-the-century structures in Chicago. Thanks to these companies the front yard now boasts a pergola and patio area. The front yard is also now graced with a copy of an antique sugar kettle which has been fitted out as a water feature. This was generously donated by the Young Professionals of Bonita Springs-Estero Association of Realtors. Another example of a contractor “stepping up” to help out with the project is AFC Electric. They are local as in literally less than two blocks away from the McSwain Home location. 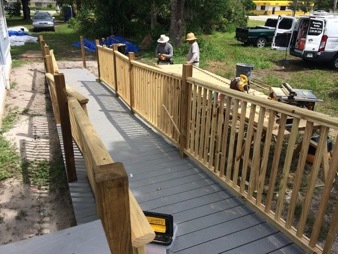 Not only are they generously donating labor toward the project, within only a couple days of asking, they were on the job working! Thom Zirkle was a pleasure to work with and much thanks go to him and company president, Justin Sheffield. The Sheffields are well-known and longtime residents of Bonita Springs. The Society is also very grateful to the Stallman-England Company. You may have been seeing some of their trucks around town as they are doing much of the irrigation work on the downtown infrastructure project for the city. Early in the McSwain project, Vice President Steve Hall volunteered to install and provide a state of the art drip irrigation system. The system will allow the BSHS to apply for certification in the Florida Water Star conservation program. The program sets standards and guidelines for water efficiency. So, not only is Stallman-England saving the BSHS money on the landscaping portion of the project, the Society will save long term with lower utility bills with this addition of new technology to the historic property. It also gives the Society a head start on the future gardens planned for the property. Landscaping goals include highlighting native and period appropriate plants. In late 2011, the Humphries family graciously donated the McSwain Home to BSHS. Because the home is one of Bonita's oldest houses and a fine example of early pioneer architecture, it was decided to renovate the house and use the location to increase awareness of our town's history and highlight the beauty in historic buildings that contribute so much to our old Florida, small town character. When the house was built in 1915, the road was called Heitman Avenue. Only later did it become the Tamiami Trail, part of US Route 41. It is the oldest building remains on our section of Old US 41. 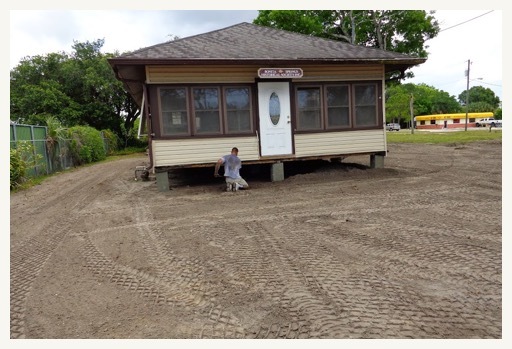 During Phase I of the restoration, new pilings were added beneath the house and repairs made to the framing and flooring. Deteriorating windows and doors were replaced, the interior was reworked, vinyl siding was removed, and the original wood siding was restored. Electric and plumbing were brought up to date and an air conditioning system donated by the Trane Company was installed. The home is now stabilized, solid, and protected from the elements. With generous help from members, friends, and local companies, the McSwain Home is on its way to becoming a highlight of the downtown revitalization project, but much remains to be done. 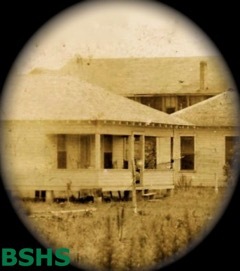 BSHS continues its efforts to raise funds to complete the McSwain Home. Our wish list includes a covered porch, a handicap ramp, a new metal roof, and replacement of the out building. When completed the property will be a welcoming spot for residents and visitors offering gallery displays and more. We have completed Phase I of our overall plans with a triage focus. We focused on the house and made great progress as it had many of the problems one might expect in a hundred year old house, including rotted wood substructure and flooring. We had to raise the entire structure, construct new concrete pilings, and replace framing and flooring. 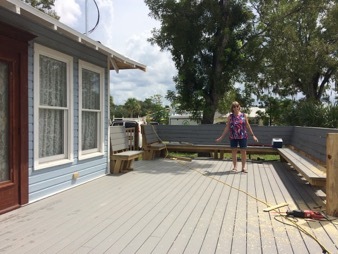 We replaced/repaired windows and doors, gutted and refinished the interior, removed the exterior vinyl siding and restored the original wood siding. We also had to replace the original electric, plumbing, and entire bathroom to bring up to code. These efforts and the installation of air conditioning means the building is now stabilized, solid, and protected from the elements. However, we do not have Certificate of Occupancy for public use of the building. As funding becomes available, we are looking forward to completing Phase II. 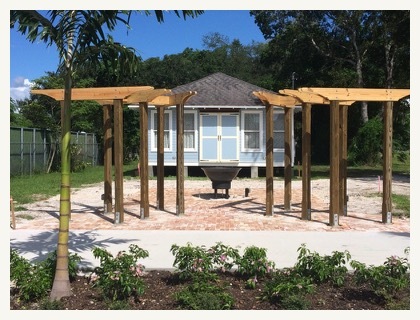 This portion is based on plans designed by architect Sam Vincent, which includes the front landscaping and addition of new covered porches with handicap ramp. Plans also call for a new metal roof (period appropriate) to replace the aging shingles. The large covered porch on two sides will greatly increase the useable public area and protect much of the building. Our intent is for the property to become a showpiece of adaptive restoration and contribute to the city’s overall downtown redevelopment efforts. Upon completion of our renovation, the house will be a destination for welcoming the public, gallery displays, exhibits, social events, and meetings. To make the house structure more "useable", Phase III will address the Annex building on site. Originally a garage and carport, it was not built in the early 1900's like the house, so it was not built with the same hard woods and quality. In fact, it is in bad shape with an old shingle roof and has water and insect damage. After many consultations, the best option is to demolish the structure instead of trying to repair. So, Phase III would be to build a new Annex building designed for multiple uses. The new building needs 2 ADA bathrooms, catering prep area, A/C storage and office area, which is lacking in the house. We also plan to add outdoor covered space, screened and open for gatherings, events, and picnics. Phase IV will include equipping and improving the interiors of the two structures for public use and education. Phase V will include landscaping and adding limited parking to the property. We hope to create a delightful and beautiful garden-type outdoor space which takes advantage of the massive existing oak trees and other period appropriate flora. With the use of native plants and flora appropriate to here in the early 1900's, the property can also be use for education. 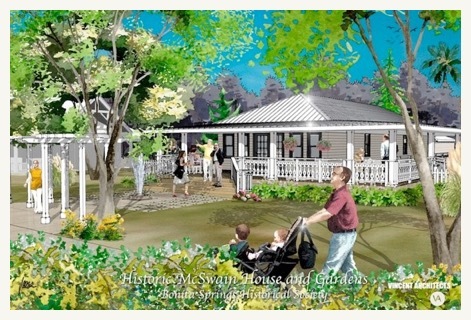 Your support for the McSwain Historic Home will greatly help the BSHS in its mission to Preserve, Protect, and Promote the rich cultural heritage of Bonita Springs. Friends like you help us achieve our goals! A lot! First came the replacement of footings and piers to level and secure the structure. The old windows were salvaged and repaired, new historically correct windows were added where windows had originally existed but had been removed and covered over. Damaged interior beams, floor joists and rotted outside perimeter beams were replaced. Wiring was modernized and brought up to code. Insulation was added. The original yellow pine floors, bead board walls and ceilings were repaired and restored. A great deal of time was given to finding, refinishing and installing a beautiful old front door. The old bathroom was gutted and replaced with a handicap accessible bathroom. Vinyl siding was removed revealing the original yellow pine ship-lap siding. After extensive repair, the house was spruced up with a coat of paint. A high-efficiency air conditioning unit donated by Trane now keeps it dry and cool. We have managed to do all of this with funds on hand and the help of many generous people. There is still much to be done - so please let us know if you can assist! 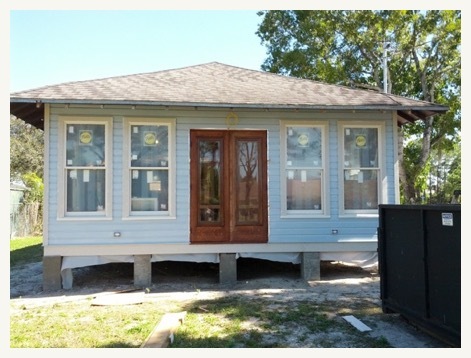 Click below for a video created by builder Russ Hillyard showing his work at the Bonita Springs Historical Society's McSwain House in 2013 and 2014. Without their help we would not be so close to completion.